The Multiple Category Transfer Grant program (MCTG) in Zambia provides grants directly to poor, labor constrained households, empowering families to decide how best to meet their needs. AIR is conducting an impact evaluation of MCTG to estimate its effect on an array of outcomes, including education, adolescent risk behaviors, women’s empowerment, and productivity. This evaluation, for UNICEF, along with the implementing government ministry, also includes a process analysis and cost-effectiveness study designed to answer questions related to program efficiency and effectiveness. AIR is implementing a three-year randomized control trial (RCT) to measure the impacts of the MCTG. The evaluation includes household and community surveys, as well as qualitative focus groups and interviews with beneficiaries, community leaders, and program implementers. AIR also designed and is managing the management information system (MIS) to monitor all beneficiaries. The MIS will improve the research capacity of the Zambian government. 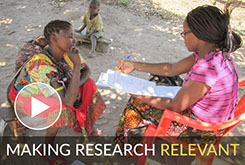 The MCTG evaluation is one of the largest and longest RCTs of a cash transfer program in Africa. The MCTG evaluation includes 3,000 households followed over three years with three rounds of data collection. We learned that the overall impacts of the program sums to a value that is greater than the transfer size. The program was originally designed with the transfer size equal to roughly one additional meal a day for the average family for one month. However, we find that in addition to eating more meals and being more food secure, families are also improving their housing conditions, sending children to school, buying more livestock, buying necessities for children, reducing their debt, and investing in productive activities. Monetizing and aggregating these consumption and non-consumption spending impacts of the program gives an estimated multiplier of 1.68. This multiplier effect is derived in part through increased productive activity, including diversification of income sources into off-farm wage labor and non-farm enterprise, the latter mostly managed by women. Unconditional cash transfer programs are often criticized for being a handout, leading to dependency and reducing work. The multiplier effect appears to put to rest the concern that transfers are a “handout.” Far from inducing dependency, the MCTG allowed households to become more productive and ultimately increase their total expenditure by an amount greater than the transfer itself. The evidence AIR generated from this study contributed to a decision by the Zambian government to scale-up a version of the program nationally, making cash transfers the country’s largest social protection program. In sub-Saharan Africa, the poorest region in the world, the number of cash transfer programs has doubled in the last five years and reaches close to 50 million people. This paper examines the impact of these programs and the extent to which they offer a sustained pathway out of ultra-poverty.